The NIKEiD Flyknit Presto will be available for your own customization for the first time of the newly silhouette beginning May 5th. Some of the options that will be available includes, customizing your cage with multiple exclusive color fades, or choose from a variety of opaque options. Selecting from three bootie options: heather, two-tone and exclusive multicolor Flyknit for a look that’s all your own. And a chance to choose from a spectrum of colors for the crash pad, then add speckles for unique style. 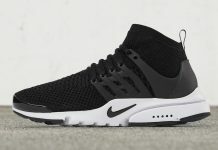 Check out the samples below and look for the Nike Air Presto Flyknit iD to be available tomorrow, May 5th directly on NIKEiD. The retail price tag is set at $200 USD.